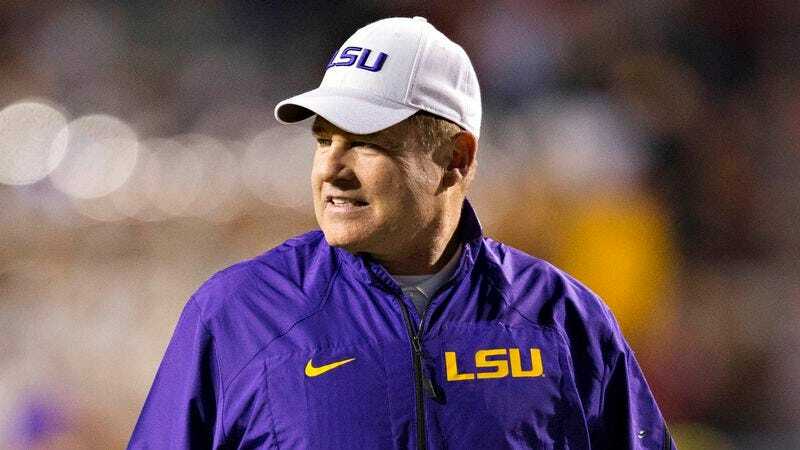 BATON ROUGE, LA—While speaking to several potential Louisiana State University football recruits Monday, head coach Les Miles reportedly reassured the high schoolers’ parents that he considers the players on his team like his own sons whom he can cut from the team anytime he wants. “These boys aren’t just pieces on my roster—I treat them like my very own flesh and blood and won’t hesitate to cut them at the drop of a hat if they start underperforming,” Miles said to the mother of LSU Tigers quarterback prospect Jerome Fielding, emphasizing that he cares for his student-athletes much in the same way a father would care for his children whom he would immediately dismiss in the event one of them was injured or hit his athletic ceiling earlier than expected. “Rest assured, Mrs. Fielding, if Jerome chooses LSU, he won’t just be getting a great education and the opportunity to play for a top football program; he’ll become part of a new family. A family who, if he has a bad week, or if another family member comes along with better field vision and quicker feet in the pocket, won’t hesitate in the slightest to throw him on the bench for the rest of the season, after which he’ll be kicked out of the family and lose his scholarship.” Reached for comment, several current LSU players told reporters that they themselves consider Miles a father figure whose contract will likely be bought out if the Tigers don’t go at least 10-2 this season.